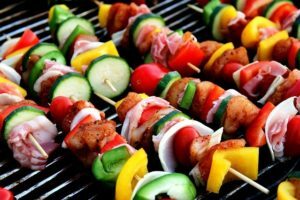 Looking for an electric grill to serve your hungry family or friends with delicious meats, veggies or kebabs? Do you love to grill outdoors on a summer or spring day but do not like the hassle of cleanup? Also, if you are having a party with BBQ fan friends or having guests at home, you need a grill big enough to meet the need. 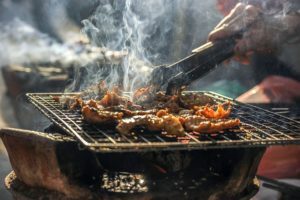 Or simply you want to enjoy your favorite grilled food even in an apartment where charcoal and propane grills are prohibited. Then George Foreman GGR50B 15-Serving Indoor/Outdoor Electric Grill is just the thing that you need. Don’t miss to read our best indoor grill review. This grill is perfect to use on a regular basis and also big enough if you’re having guests. It comes with removable nonstick grill plate, so you can clean it easily. You can use it indoor as easily as outdoor. And most impressively it all comes at a surprisingly affordable price. Keep reading to find out why it will be perfect for you. This grill is electric and comes with a dome with vented lid. You can use it indoor simply by separating removable grill stand and put it on a tabletop or use it for countertop cooking. It has fat removing slope and removable grill plate with a durable nonstick coating. You can just remove the plate after grilling and wash it easily in the sink. As it is electric, so it heats up in a couple of minutes and you can cook really faster than the gas or charcoal grills. You can use it year-round, even in winter. It takes a small amount of space compared to massive propane grills nonetheless, it has enough room to grill for a big family or a party consists of maximum 15 members. This grill comes with a sturdy removable grill stand. So, you can enjoy grilling on a patio. Assembling is really easy. You only have to attach 5 or 6 parts without any power tools. You can even take it on vacation with you. This grill has stands that can be removed easily and thus it can be transformed from an outdoor grill to an indoor grill. Its weight is just 21 pounds. As a result, it is very portable and it can be used for counter top cooking with ease. It has a removable grill plate with durable nonstick coatings. So, cleaning a grill was never been this easy. You just need to remove the plate which is immiscible, then wash it in the sink. But remember it is not dishwasher safe. You can use some sponges which are made especially for this. The price of this grill is very affordable considering the price of other grills. So, if you are new in grilling you should definitely start with this. Takes only a couple of minutes to heat up. Temperature is consistent throughout the cooking. Therefore, there is no need to spend a large chunk of money after charcoal or propane. Use this cost and energy efficient grill. With its 240-square inch cooking area, this grill offers ample space for cooking. Hence if you are looking for a grill to cook for a big group of people, this grill is a good option as you can make 15+ servings with it. Though electric grills are unable to produce the flavor that is totally identical to charcoal grills, the taste is delicious and different. It delivers a unique taste that is better than normal broiling or stove top cooking without the problem of uneven cooking for hotspots. So, if you want fast and easy grilling with a unique flavor that only electric grills can deliver than it is a great option. Large cooking space that can be used to make up to 15+ servings. Removable stands allow it to be used in both outdoor and indoor. Very convenient for apartments or condos where charcoal or gas grills are not accepted. Use electricity, as a result, you don’t have to use a large amount of money for charcoal or gas. Small in size, so easy to use in small patio or tabletop. Very affordable compared to other similar products in the market. Very light in weight (Only 21 pounds), so it is easily portable. As it uses electricity for heat, the cooking is extremely fast. Easy to clean as the grill plate has a nonstick coating. Top heavy without stands, therefore, you have to pay attention when grilling near kids. Power supply cord is somewhat short. Large grill plate makes it difficult to clean it in small sinks. Grilling outdoors is somewhat risky on a very windy day. The flavor will be a bit different from charcoal or propane. Q: Is it possible to use an extension cord with this grill? Answer: Yes, it is possible to use an extension cord with GGR50B, I recommend you to use a heavy-duty extension cord. Q: How long it will take to assemble the grill? Answer: It will take maximum 10 minutes to assemble the grill as it is very easy to assemble. You don’t need any screw or hammer or any other power tools. Just attach the parts and plug the power cord. Q: Where can I get instruction/User manuals? Answer: Assembly sheet and heat chart comes with the grill. You can also download it from George foreman website. Q: Is there cover available for this grill? Answer: Yes, you can find appropriate cover for this grill. Q: Can I use a dishwasher to clean it? Answer: No, using a dishwasher to clean it, is not safe. It can be damaged in case of soaked connections. All the information you should know before buying this george foreman ggr50b product is included in this article. Except for some minor problems this electric grill is perfect for day to day use, both in indoor and outdoor. It is highly popular with the users for its ease of maintenance and very reasonable price. So, if you think this grill is perfect for your need you can buy it from this link.